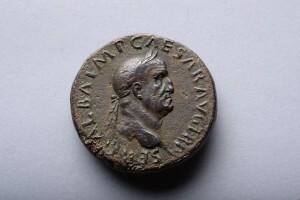 News of the defeat of Otho was brought to Brixellum, many of Otho’s troops urged him to fight on, pointing out that more troops were on the way, but the emperor chose suicide rather than cause more deaths. Vitellius continued his march on Rome, where he made a triumphal entry and was recognized as emperor by the Senate. 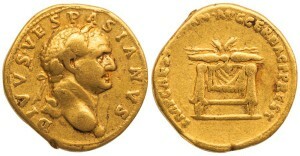 Before the eastern legions could reach Rome, the Danubian legions of the provinces of Raetia and Moesia also acclaimed Vespasian as Emperor in August. Three of these legions had been on their way to support Otho when they heard of his defeat at the first battle of Bedriacum. They had been made to swear allegiance to Vitellius, but when they heard of Vespasian’s bid for power they switched their support to him. They persuaded the other two legions easily to join them, as they were the legions which had been defeated at First Bedriacum, and had been made to build amphitheatres for Valens and Caecina as punishment. Led by the commanding officer of the seventh Galbiana, Marcus Antonius Primus, they marched on Rome, and having a shorter distance to march reached Italy before Mucianus’ troops. When Vitellius heard of Antonius’ approach, he dispatched Caecina with a powerful army composed of four legions together with detachments from seven other legions and a force of auxiliaries. 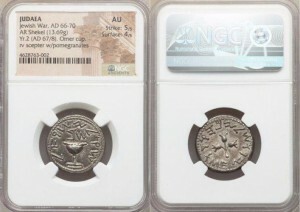 The first of Antonius’ legions had arrived at Verona, but though urged to attack them before the remainder of the army arrived, Caecina declined to do so. 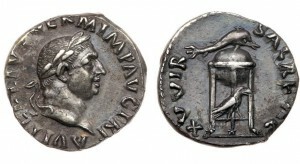 Caecina had been plotting with Lucilius Bassus, commander of the Classis Ravennas, the Roman fleet at Ravenna, to switch their support to Vespasian. His troops refused to follow his lead however, and put him in chains. Valens, who had been delayed by illness, had by now set out from Rome. Caecina’s army, now without their general, advanced on Cremona. 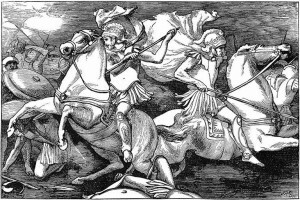 Antonius was now based at Bedriacum, and advanced towards Cremona with a force of cavalry. They encountered the vanguard of the Vitellian army between Bedriacum and Cremona on the 24 October and a battle followed, with Antonius sending back to Bedriacum for the legions. Antonius’ troops had the better of the fighting, and the Vitellian troops retreated to their camp outside Cremona. Antonius’ forces advanced along the Via Postumia towards Cremona. They were opposed by a powerful Vitellian army, who had been reinforced by other legions but were still without a commander as Valens had not yet arrived. By now night had fallen and the battle continued through the hours of darkness. The seventh Galbiana, Antonius’ own legion, suffered heavy casualties and lost its eagle for a while, though one of its centurions later sacrificed his own life to win it back. Eventually Antonius’ forces began to gain the upper hand, and the turning point came when dawn broke. Antonius’ third Gallica had served in Syria for many years and while there had adopted a local custom. As the sun rose they turned to the east to salute it, and this was misinterpreted by the Vitellian forces who thought that they were greeting reinforcements from the east and lost heart. The Vitellian forces were driven back into their camp, which was taken by Antonius’ forces. Antonius then attacked Cremona itself, which surrendered. Cremona was burned by the victorious troops. Antonius continued to Rome, where Vitellius was taken prisoner and shortly afterwards killed. The way was thus cleared for Vespasian to ascend the throne near the end of this bloody year of crisis, the Year of the Four Emperors.